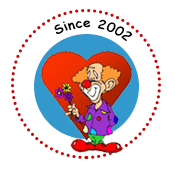 Purchase tickets for the Caring Clowns International April 9 Auction, by clicking the PayPal Donate Button below. Tickets are $55 per person. If you would prefer to send personal checks, send them to: Caring Clowns International, P.O. Box 75, Suquamish, WA 98392 (Please annotate checks with “April 9 Auction.”) Thanks you for your support!